Pet Dental Care – Why it's so important! Home / Articles / Pet Dental Care – Why it’s so important! Katherine has credentials in Domestic Animal Science and Animal Grooming, with years of experience in all things pets. She hails from Canada and has been a writer for 5 years. When Katherine isn’t writing you can find her playing on her Xbox, listening to metal, and playing with her labrador/pitbull, Anastasia. Most pet parents don’t know that pet dental care is just as important as regular trips to the vet, which in itself is crucial to the overall health and well-being of your pet. 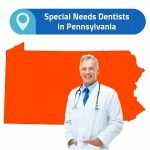 Veterinary dentistry is a large portion of the happy, long life of your pet, and educating yourself on what options are available, what you can do yourself, and what is important for both dogs and cats, among all pets and animals you may have, is just part of being a pet owner. With so many products and services, both in and out of your vet’s office, dog dental care has never been easier. If you are unsure whether or not your dog needs to see your vet or dog dentist, pay close attention to both the signs listed below and your dog’s behavior recently. Dog teeth cleaning is extremely important for the health of your dog but is not something that always needs to be done at the vet. 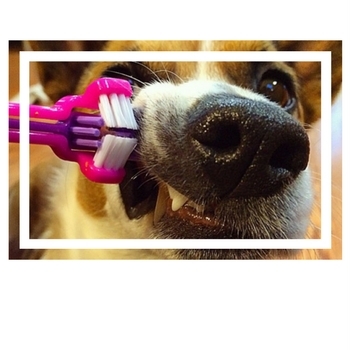 Did you know that you’re able to clean your dog’s teeth at home using certain products and procedures? If not, and you’re a dog owner, then this information will definitely be something that you’ll want to pay close attention to. Keeping your dog’s teeth and mouth clean between vet visits, but not as a dog dental cleaning solution entirely, can help keep your dog healthy and happy, and can even keep the vet bills to a minimum cost! 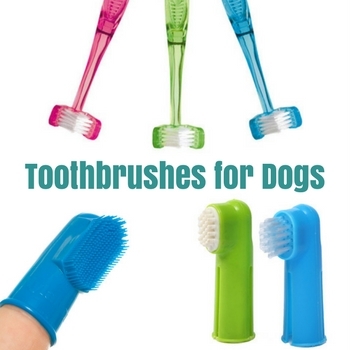 Finding a toothbrush for your pup is relatively easy. You can purchase one through your vet’s office, or go online and make a selection there. A lot of brands have products available on their websites, including brushes and paste, so it’s very easy to find what you’re looking for and make a purchase. Remember that using toothpaste made for humans is extremely dangerous and should never be used on your dog. Fluoride is very toxic to animals, especially dogs, which is why there are specialty canine toothpaste available for purchase through your vet or online at a brand’s website. 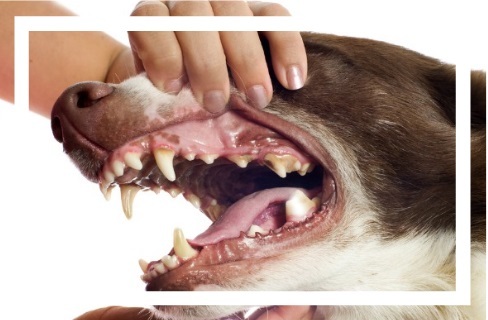 Dog teeth cleaning is actually very easy to do, it’s the dogs that tend to have a problem with owners doing it, which is why it’s best to introduce the brushing of their teeth when they are a puppy so they can grow into it. However, if you’re starting your dog at an older age, ensure that they are comfortable and that you do not make the experience a traumatic one. Be patient, safe, and do a good job. Start by giving your dog a good burst of exercise so he or she is more likely to sit or lay nicely for you, and be aware that he or she might make a go for the brush itself once it’s in their mouth. Start slow, brush gently, and look for signs of stress. If your dog becomes unresponsive, aggressive, agitated, or begins to cry, he or she is becoming too stressed out to move forward and you must stop. If you don’t they will learn that when the toothbrush comes out, it’s time for them to hide, and that is the last thing you want. If this is the first time you are doing this focus on the teeth only or just below the gum line. 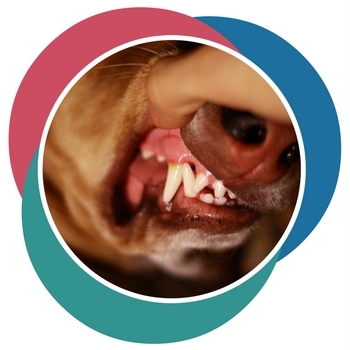 Your dog’s gums may be a little sensitive, especially if he or she is having certain dental problems already, and keep an eye on whether or not the gums begin to bleed. If your dog should emit a pain response for any reason, stop what you are doing and bring him or her to the vet immediately. Continuing could worsen whatever is going on in their mouth and that is the last thing you as a pet owner wants. 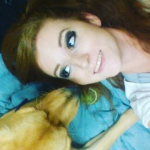 If you don’t end up getting their entire mouth the first time around that’s perfectly fine, breaking this type of activity in is new for your dog, considering it’s just like getting a child to get used to it, so be patient. After it’s been done a few times you can increase the amount you do it and for how long. Tell him or her how good they are being, leave a treat that they will be able to see for after the teeth are done, and try your best to make this a positive experience. Because there is such a vast line of toothbrushes, toothpaste, dog dental treats, and other products that relate to the oral hygiene of dogs, selecting a brand and product can be extremely difficult if you don’t have a regular brand or have never shopped for one before. To start, dog toothbrush and the like are the best place to start and will be the foundation for good pet oral hygiene at home. Having a good toothbrush designed for dogs will ensure that your dog can avoid serious oral issues and could even cut your vet bill in half. Boshel is one of the most trusted brands that can be found online when it comes to toothbrushes for dogs. They have brushes that range from simple to advanced dental care and will be one of the best dog toothbrush you could invest in. Boshel has two dental brushes that are an absolute game changer. While their line may not be a large one, they are one of the most trusted brands for all things dog, so you will be able to trust in them fully and know your dog is getting the best. Pet Republique is also another great choice brand for a dog toothbrush. They cater to both styles of toothbrush, being a finger slip or a stick brush, and are great for both beginner and advanced brushers. Pet Republique also donates 15% from each purchase to dogs and cats needing loving homes, which is great for your karma and caring heart. • Has my dog had his/her teeth brushed in the past? 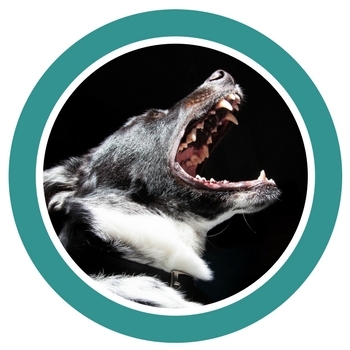 • Will my dog exert aggressive or scared behavior based on their nature? • Do I have a safe environment to brush his/her teeth in without worrying about nearby objects falling or anything dangerous occurring? 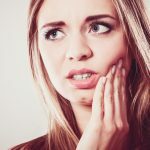 While these questions may seem silly, performing any type of dental or health-related procedure, no matter how minor, yourself is a very big thing. It must be done properly in an environment that is both safe for you and your dog. Selecting the proper toothpaste is just as important, if not a tad more, than making a decision on a toothbrush. The reason for this is that the toothpaste has some ingredients that your dog may be allergic to, or is one that you want to put your trust in 100%. Like a toothbrush, dog toothpaste comes with a seemingly endless line of brands and products to choose from, especially when shopping online. Going to your vet to find a trusted toothpaste for dogs brand can be expensive, so if you’re looking to save some money but still get a brand that will keep your dog’s mouth healthy, going online is your best bet. Nylabone is one of the most trusted brands for both toothbrushes and toothpaste and is known to create value packs, such as their Nylabone Advanced Oral Care Natural Dental Kit, which is great for dogs. It’s a safe, natural kit that covers both bases, being a brush and paste. It incorporates Denta-C, which is a component that drastically improves canine teeth. If you looking for a brand that offers value options, SENTRY Petrodex has you covered. They offer their Enzymatic Toothpaste as another option for a healthy, safe toothpaste. The enzyme properties in the toothpaste aid in controlling tartar and plaque growth while polishing the teeth to make them like new again. Keeping your dog’s mouth healthy and clean does not always mean brushing, you can actually buy specific treats and related products that will clean their teeth as they use and play with them. This makes cleaning incredibly simple, affordable, and fun for both you and your dog. If your dog gets aggressive or too stressed out during any grooming procedure, which includes dental care, then the following products are the best way to incorporate a healthy mouth without spending too much at the vet. 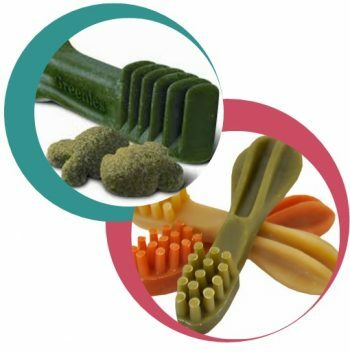 GREENIES Original Dental Dog Treats are hands down one of the best cleaning alternatives next to brushing and are made for all sizes of dogs. Regular, large, petite, and teenie are all size options, and you can buy the boxes in. These treats are one of the best choices for dog dental chews because they are nutritionally complete, help to fight tartar and plaque buildup, and improve the teeth and gums of your dog while he or she eats them. Nylabone creates a wide range of products to help all pet parents with their pup’s oral health. Their Advanced Oral Care Liquid Tartar Remover is the best way to keep your dog’s mouth clean without brushing. All you do is add a small amount into their water by combining a single tablespoon of the remover with every 32 oz. of water. You can give your dog as much as you want, even refilling up to three or more times per day, without worrying about any damage or side effects, which is good news for dogs who cannot stand having their teeth brushed. The product works through the safe alteration of the pH levels through the saliva. It’s 100% safe, however, because all it does is ensure that your dog’s saliva is like a cannon, shooting bad breath, tartar formation, and plaque straight out of the water. PEDIGREE Dentastix is also another great brand and product for dog dental treats. They offer great cleaning action in the form of a treat, come in multiple sizes, and cater to almost any flavor you can think of. They come in Fresh, Beef, Original, Bacon, Beef & Original, and in a Variety pack. One treat a day is the equivalent of a good brushing session, with the X-shape aiding in reducing and eliminating tartar and plaque buildup. With so many options for dental care besides brushing, with very reasonable prices, shopping online is the best place to go besides your vet. You have options that cater to all sizes, tastes, and even budgets. 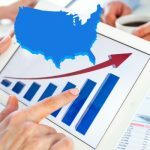 You can help yourself to save money with prevention by using these products. Even though you can take care of your dog’s dental health at home, it’s still very important to bring your dog regularly to the vet to examine their oral and general health. However, knowing a typical cost before actually going to your vet will help you in your planning and ensure that you don’t get too blindsided by your bill before you leave. The typical dog dental care cost can be a high one, as any regular bill would be, but keep the following information in mind. If your vet has recommended that your dog has a tooth pulled, it’s for a very good reason. Whether it’s because of advanced periodontal that has led to tooth decay, or the complete destruction of a tooth, it’s important to know why and how much this is going to cost you. If your vet has indeed recommended the removal, there is definitely nothing you can do on your side as the owner to repair it from home. The cost can vary based on where you live and certain factors in the mouth that may be a complication, such as any current abscesses, which are fairly common with dogs and will require antibiotics after the tooth has been pulled. Based on any the door fee, the fee for the procedure itself, complications, the medication that will be needed before and after the procedure, and any after care provided by the vet, you are looking at a price that sits between $200 to $600. Your vet should be walking you through the process of what he or she will be doing, which could include sedation, for example, that will help you outline what to expect in your bill. Ask your vet about the various costs that will be involved when going over what the procedure will entail and calculate it in your head so you know what to expect. Depending on the means deemed necessary to take by your vet, such as in-office care, for example, and any other factors, you’re looking at paying from $500 to $1500 to have a cavity fixed by your dog’s vet. Cleaning your dog’s teeth at home is very important, but having them professionally cleaned at the vet’s at least once a year is definitely necessary for the oral and general well-being of your dog. Because each vet has different prices for door fees, additives during the procedure, the procedure itself, etc, getting a set estimate is something that is not easily done. However, most vets generally charge between $300 to $400 for the procedure itself, so check with your vet to find out the exact dog teeth cleaning cost with the procedure and added fees. If you’re a puppy parent then you’ve no doubt heard about pet insurance, but did you know you can take out coverage for dental insurance, as well? While it can be difficult to find, there are avenues you can visit to find the best company, coverage, and price for you and your pet. To learn more about doggy dental insurance and where you can find it in your area, click here. Cat dental care, just like canine, is just as important as general health care and should be paid close attention to. Cat teeth are susceptible to complications, cavities, and other forms of decay and infection just like dogs, so keeping a close eye on your feline’s mouth is crucial to their health and well-being. While dogs tend to have more options available to them, cats also have plenty of options to ensure they live just as happily, healthily, and have the proper cat dental care that they will need. Seeing a cat dentist or specialty vet may not always be an option, but there are preventative measures that can be done at home to ensure that you do the necessary cat teeth cleaning that domestic felines need. When it comes to the oral health of your cat, looking for the signs of poor dental health can be difficult. Dogs will generally let you look in their mouth, but cats more often than not put up a serious fuss when you try to do so, but there are signs of poor oral health that you can and need to look for. If someone tries to throw the “but feral cats are fine” argument at you, disregard it. Cats have become domesticated and therefore no longer need to hunt as their counter-cats do. If you see any of the above signs, monitor your cat closely for the less serious signs, such as the bad breath, but once they go to an advanced stage, which would include refusing to eat or weight loss, immediately bring your cat to the vet. Neglected dental problems, conditions, diseases, etc will lead to abscesses, advanced periodontal disease, and even tooth rot. While domesticated cats do not have to rely on their hunting skills and tools, which especially include their teeth, they are necessary for daily life. Imagine not being able to eat because of tooth loss, rotting teeth, and painful gums. If your cat’s teeth appear dull, yellowish, and their gums are not a healthy pink color, those reasons enough are what should push you through your pet’s door, not including the reasons listed above. Like with dogs, there are many products for cat dental care at home that can be taken advantage of. However, unlike dogs, your cat is more than likely going to fight you more than a dog would do so. Getting your cat into the routine when he or she is as young as possible is the best way to avoid difficulty as they age, but it’s never too late to start. 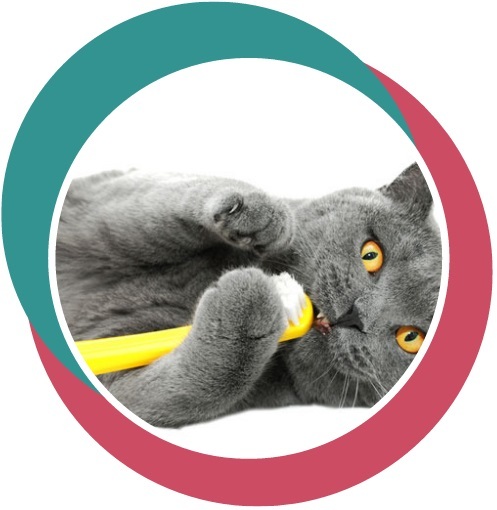 Remember that just because you are performing basic oral health procedures at home, which include brushing your cat’s teeth with the necessary products and tools, it does not mean that it is a replacement for services your vet offers unless you are a vet yourself and have the means to do so at home. Start by playing with your cat and getting their energy levels down a bit. If your cat is naturally calm and relaxed you may not need to do this, but it’s best to try and get as much energy out of them as you can. Bring your cat onto your lap, pet him or her into relaxation, then gently raise the lip on either side of the mouth and begin to brush the outer areas of the teeth. Brush away from the gum line to ensure that any food particles that may be embedded are pushed out and away. If this is your cat’s first time with a toothbrush, then no doubt it’s going to be a bit of a struggle. You will probably need to open the mouth more, but do not pry. Like dogs, cats need to be coaxed into home dental procedures properly and gently, and not be made to do things. If your cat becomes stressed out, signs include being unresponsive or limp in general, for example, then he or she will need to be given a break before the experience becomes a traumatic one. Like a dog, if your cat becomes aggressive and tries to attack you to get away, immediately stop the brushing and consider having your vet do a regular cleaning instead. Should your cat become aggressive and you decide to keep going, you endanger yourself and your cat by pushing forward, and that is not worth the risk to the well-being of yourself and your feline friend. If your cat is fighting you and trying to close his or her mouth, gently pinch the cheeks in between two of your fingers and begin to brush again. Work your way through your cat’s mouth fully, give him or her a treat when you are done even if they were a nightmare to deal with, then let your cat be alone for awhile if he or she chooses to run away. After doing this a couple of times you will find that your cat will get used to it, tolerate it, absolutely hate it, or maybe even like it. 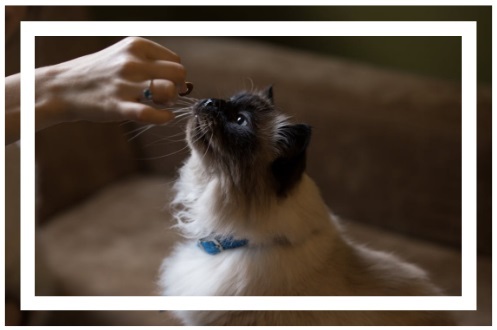 Keeping a treat handy and in view will give your cat the sense that, even if they are being bad and fighting you over this, he or she will learn that a few minutes of enduring such a procedure will at least have some happy ending. Using the proper tools from reputable brands will ensure that your cat’s oral health stays healthy between regular visits to the vet. Going online trying to find the best brands and products can be a challenge, however, so knowing where to start is half the battle. When it comes to finding a cat toothbrush, cat toothpaste, and cat dental treats, which are great to use if you’d rather the treats compared to using a brush and paste, brand’s websites have some of the best picks even though the selection is a small one. Spending a small fortune at the vet for these products may not always be in the budget, and a well-stocked pet store catering to such items may not be close enough to you, so shopping online will be your best bet if either or both are the case. Finding a cat toothbrush online is incredibly easy, but finding one that is of great quality from a reputable brand can be like looking for a needle in a haystack. 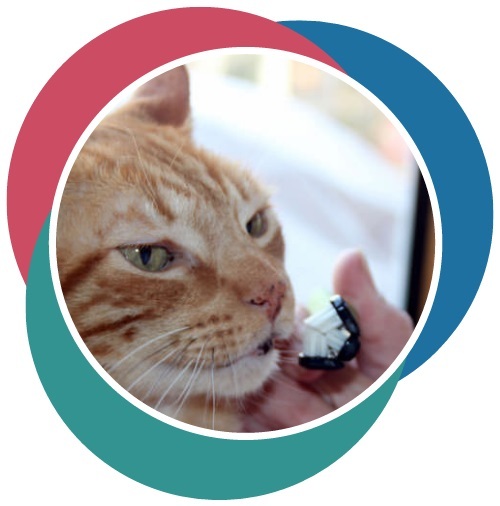 SENTRY Petrodex makes dental products for cats as well, not just for dogs. Dental Kit for Cats by SENTRY Petrodex is by far one of the best toothbrush kits you can get. It comes with both a stick and a finger brush and the toothpaste for added value, with the brush developed by a specialty veterinarian to ensure the design is exactly what is needed in a cat toothbrush. The kit, when used together, fights bad breath and reduces plaque and tartar buildup. The Bessie 360-Degree Toothbrush by Alfie is technically a brush for dogs, but it’s also perfect for those with fussy cats who need a quick clean should their feline baby put up a fight. It definitely looks like something you’d clean your toilet with, but like a toilet brush it gets every inch of surface, but in this case, it’s your cat’s mouth. If you have a cat that wants nothing to do with a toothbrush, gets aggressive and agitated, but you still want to try something, the finger brushes are always a decent last resort and tend to work when regular brushes don’t. Petosan’s Microfiber Finger Brush is a great pick. Instead of a finger brush that is hard plastic or rubber, this one is crafted from chemical-free, self-cleaning, antimicrobial microfiber. It’s great for a quick, deep clean, mainly because you can feel where your finger is going, and can be used with toothpaste. While there may not be many brands or products that are designed to be a toothbrush for cats, there are multiple ones for dogs that, if used or made gently enough, can also be a multi-use brush for cats, too. Finding cat toothpaste is almost just as difficult as finding a cat toothbrush only for cats, but there are some great options on Amazon. For one, Mindful Pet’s Dental Gel Toothpaste for both dogs and cats is a great natural cleaner but is a bit on the pricey side. However, it’s made with aloe vera, soothes cases of minor gum irritations, and does everything a regular toothpaste does. Your pet may not like the taste considering it’s mint flavored, but you never know. The previously mentioned SENTRY product for the cat category, being the toothbrush kit, comes with a great malt cat toothpaste. Because SENTRY is such a trusted brand, you know the toothpaste will definitely be up to any vet’s standards. In fact, the entire kit was designed by a vet, with the malt toothpaste created enzymes that produce hydrogen peroxide for added dental health. If your cat completely refuses a toothbrush, even the simpler, less invasive ones, you still have plenty of options through cat dental treats and other products. These treats and general products are designed to take the hassle and frustrating moments that brushing your cat’s teeth can bring, especially if your cat can become aggressive and a nightmare to deal with. SynergyLabs has created an exceptional product for cats that works through a water additive, much like the additive that was previously mentioned in this section of the dog category, which is the Dental Fresh frustration-free oral health product. It comes in the sizes of 1-gallon, 1/2 gallon, 8 FL.oz., 17 FL.oz., and 32 FL.oz., with canine options as Original, Advanced Plaque, and Tartar, and Advanced Whitening. There is a formula that is specifically designed for cats only, restores enamel, and even whitens teeth over long periods of time. This wonder product even eliminates any bacteria or slime that can usually be found in water bowls. There is zero taste, too! GREENIES also carries a product specifically for kitties, the FELINE GREENIES Dental Cat Treats, which come in Catnip, Beef, Chicken, Chicken & Salmon, Ocean Fish, Salmon, and Tuna flavors. You can get them in packs or boxes, with the sizes ranging from 2.5 oz., 3 oz., 5.5 oz., and 12 oz. GREENIES is a brand that is highly regarded and recommended by vets in general. Not only do these treats aid in dental care, but they also provide added minerals, vitamins, chlorophyll, taurine, and are only made from natural ingredients. Purina’s Dental Crunch are another great example of cat dental treats. They are snack treats specifically designed to reduce the buildup and tartar, freshen breath, and clean their teeth all at the same time. They also contain omega-6 fatty acids that greatly help their fur, too! Where your cat’s teeth are concerned, dental products help in prevention and protection save money by using this stuff. Your cat will definitely thank you for doing so! As previously stated and outlined in this section of the canine category, dental care costs are both crucial to your cat’s health and a pricey, but necessary, investment. Taking the above home dental tools into consideration, remember that your vet is the only person capable of truly deep cleaning and fixing your cat’s oral health. Though it can get costly, the love and long life of your cat are absolutely priceless, but the following rundown will give you a general idea and starting point on how much the cost of dental care for cats will run you. Most vets will determine the base cost of any surgical procedure for a dog by weight and go from there, but cats are a different story. Generally, the base cost will be around $200 plus an approximate additional $100-$200 for the extraction of the tooth. However, keep in mind that there will be costs for IV fluids, anesthesia, and any other aspect that will go into the surgery, so be sure to ask your vet about it. As previously stated in this section of the canine category, because it does relate, your vet will be able to give you a full rundown of the total estimated cost before the surgery can begin to extract the tooth or teeth, if more than one is needing to be removed. Certain complications, such as an abscess, for example, can up the price greatly, as well as any antibiotics that may need to be taken at home after all is said and done. The cost of pulling tooth will not be a small one but is definitely worth it where your cat’s oral health is concerned. As for the cost, you’re going to be looking at an approximate base cost of $600 to $1000. As previously stated, cats have smaller, more delicate teeth and that is why the cost is so high to treat and fix cavities. The base cost will also depend on the severity of the cavity, whether there is more than one present, etc. Remember that there will be other additives involved as well, including the anesthesia and any antibiotics that may be needed. If you see more than one of the above signs, bring your cat to see their vet immediately, as they could have a full or developing cavity. Even simply calling the office and describing what symptoms you have seen, as well as asking for a price list, will ensure that you are fully in the know, can prepare for what’s to come, and will be ready, especially when it comes to your wallet. It’s no secret that any procedure at the vet that is done on a cat will definitely not be a cheap one, which can also be said for the cleaning of a cat’s teeth. The average base for cat teeth cleaning cost is anywhere between $400 to $800. The overall price will depend on whether the cat will have to be put under an anesthetic to remain calm, if they are undergoing any testing or another procedure while there, etc. If your cat’s teeth have not been cleaned in years, and there are noticeable discoloration and damage, for example, then you will definitely want to prepare yourself to pay close to the maximum amount listed as the base cost, if not a lot more. Like dogs, cats can have dental insurance coverage and policies taken out to ensure that they are protected should an emergency occur, and that their owners will not be dealt such a hard blow when they get the bill. For more information on pet dental insurance, and for help in finding a company that will work best for you and your cat, click here. Our pets are like members of the family, so doing what we can as pet owners to ensure that they are healthy on all fronts, including where their dental health is concerned, is the best way to ensure that they remain in our lives for as long as possible. 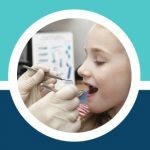 Taking your pets to the vet regularly is extremely important to their health, but there are also many ways we can help their dental health improve and stay at a good level between each visit without spending too much, this will help prevent a trip to an emergency dentist if their teeth get too bad. Amazon has a great selection to choose from, with products designed for the well-being of pet’s dental health, so there is always an option or tool to help our furry friends be at their best. How Much Does It Cost To Get a Dog’s Teeth Cleaned?